SAN DIEGO, CA (April 27, 2018) -- IDW Publishing and SEGA® of America announce today that Sonic The Hedgehog #4, the latest release in the weekly April launch event for IDW's brand-new Sonic comic book series, has sold through its first printing. The swift sell-out of Sonic The Hedgehog #4 continues the momentum marked by the sell-out of issue #1's first and second printings, as well as the first printings of Sonic #2 and #3. 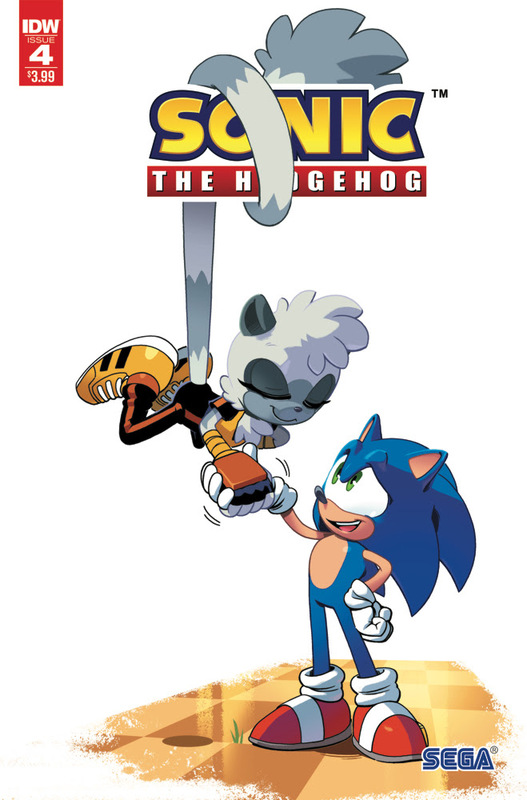 To meet the demand of fans and retailers, IDW will release a second printing of Sonic The Hedgehog #4 on May 30th with a brand-new cover highlighting the newly-introduced character Tangle the Lemur. The second printing of issue #4 will feature a cover by artist Evan Stanley and colorist Matt Herms. Tangle, the newest female heroic character, and the first-ever ring-tailed lemur in the Sonic universe, shares the cover with the beloved hedgehog hero. Tangle's first appearance takes place in this very issue, joining Sonic and Blaze the Cat as they race to save a town under attack from the evil Dr. Eggman's Badnik army. "It is incredibly satisfying to launch a title with four issues in a single month and to have all four issues sell out," says David Mariotte, associate editor on Sonic The Hedgehog. "It speaks to the talents of our creators who introduced a new version of Sonic's story that's already resonating with people, but it also speaks very highly of the fans who chose to embrace Sonic, Tangle, and all the gang so whole-heartedly." For fans eager to acquire the first four issues of Sonic The Hedgehog in one fell swoop, IDW has solicited the Sonic The Hedgehog #1-4 Box Set for release in June. This exclusive collector's edition comes with five rare variants of Sonic The Hedgehog: a sketch variant of issue #1, plus virgin cover variants of the Tyson Hesse covers from issues #1-4, so that fans can place the four connecting covers together to see one perfect image. For more information on securing copies of the second printing (Item Code MAR188497) or the box set, contact your local comic shop or visit www.comicshoplocator.com to find a store near you.